Zero-Gravity Flights at Chkalovsk, Star City, Moscow. Experience Zero-Gravity in a flying laboratory of Russian Cosmonauts IL-76MDK ! Zero-Gravity flights is a part of real Cosmonauts training in a Star City Cosmonauts Training Center named after U. A. Gagarin. This is a unique opportunity to experience weightlessness without flying into Space. - MiG or Sukhoi flights could be added to your Zero-Gravity package. - prices include hotel accommodations (w/breakfasts), Monino Museum Tour, Moscow Tour and Zero-Gravity flight for one person. - airfare is not included! - group discounts apply. To see exact prices - please click on the appropriate order link below. 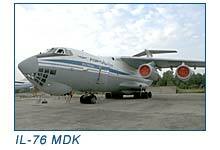 The "IL-76 MDK" wide-body airplane is a unique flying laboratory, which can create short-term weightless conditions. To achieve a short-term micro-gravity, the aircraft flies in a parabolic pattern (Kepler curve), rising to a height of about 22,000 feet, and then curving downward. Weightlessness lasts for 25 seconds and can be recreated up to 15 times within one flight. The Zero-G flight lasts 1,5 hours. Total time of your stay in weightless conditions is approximately 250 seconds. - dates are subject to change if group is less than 6 people! Monday: Arrival day. We will meet you at the airport and transfer to your hotel. Our representative will have package documents with a program and answer all the questions you might have. Tuesday: Moscow City tour of your choice. Afternoon - Medical Examination at Star City. Wednesday: Breakfast in a hotel. Escorted transportation to the Chkalov Airbase for Zero-Gravity flight aboard IL-76MDK. Medical examination and certification for the flight. Celebration lunch in Cosmonaut dining room. Return to Moscow to your hotel. Thursday: Breakfast in a hotel. Escorted tour to the Monino Museum. Friday: Breakfast in a hotel. Escorted to airport for departure.